It’s not surprising for the final Nyssa Glass novella that we return to the beginning. Back in the first book, she was hired (and strong-armed) by a mysterious person into breaking into the Dalhart manner and finding out what happened. Now that same person needs her again. And he’ll stop at nothing to get her. When a police investigator from her home country arrives promising to return Nyssa to justice, the young woman leaps at the opportunity to prove her innocence in the murder of her mentor Mr. Gallowy. But nothing is ever as it seems, and Ellis will have to pick up the pieces and figure out what happened to his fiancee. Nyssa will have to use all her wits as she’s confronted with the last secret of Dalhart and the consequences of her actions in the first book. What a conclusion to this series. Once again, we dive into the identity. What makes a person a person? What if there’s a copy of that person? Which is the original? Does being a copy make you different or the same? So many questions posed by the emotional climax of the Nyssa Glass novella. If you haven’t read this series, then you need to. Burke has created gold with this series. It is full of heart, wonderful characters, fun action, and nerve-wracking tension. Some of the best young adult literature out there. Fans of fantasy and steampunk of all ages will love this series. 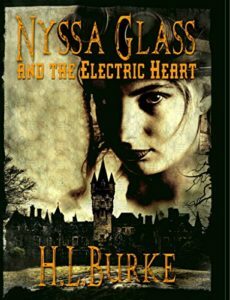 You can buy Nyssa Glass and the Electric Heart from Amazon!